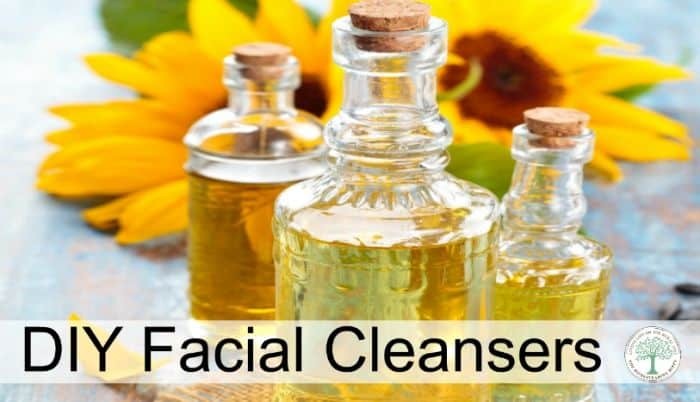 The very idea of making homemade facial cleanser using the oil cleansing method was interesting to me. I just didn’t know where to start. I didn’t like the harshness of soaps, even homemade bars. When I found out about the oil cleansing method, I wasn’t sure about it. I mean, wash my already oily skin (that seems to forget that my teen years are long gone) with MORE oil? I just couldn’t comprehend it. But, I had heard so many good things about the oil cleansing method, that I knew I had to try it. Make yourself a batch and see if you will love this all natural diy cleanser as much as I did! Here’s the ratios to try. Remember to make this your own and adjust as needed. The castor oil will be more drying, and the sunflower more moisturizing. And me being ME, I added a few drops of peppermint essential oil as well. All you do is take about a quarter sized bit of oil in your hand, and massage your face. It’ll remove makeup, dirt, and dead skin easily. Then, you take a washcloth and wet it with hot water, and “steam” your face. Do this a couple of times, and then gently wipe your face to remove all excess oil. Don’t go to hard on your skin, you won’t need it! It’ll feel really good! After about two weeks of use, I found that my “teenybopper” skin stopped rebelling, and breakouts are quite a bit less. My skin is much softer, and I don’t have that icky, tight, dry feeling followed by the oil slick that would make Exxon jealous afterwards. My daughter loves it as well and her face is smooth, clean, and clear! Thanks! I’m definitely going to try this!! I have never tried looking for Castor Oil, do I need to shop anywhere special to buy it? A special section? What a great idea! Thank you for the instruction. I really want to try this out! This Is Great I Really Need To Try! I will have to try this. My skin has gotten better since I started using more natural products, but I bet this would be even better. I’m unsure about this because you didn’t mention “mature” (I don’t like that word at all!) skin but you have never steered me wrong before so I’m buying castor oil this weekend and trying it for a couple of weeks! I think I’ll try adding lavender oil to help. Thank you for all you do!